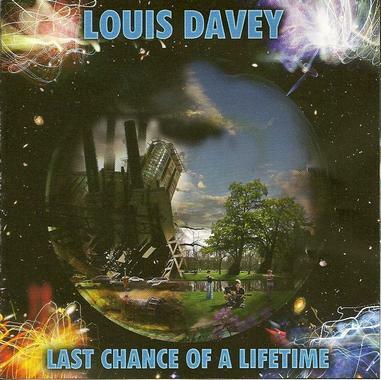 Louis Davey – "Last Chance of a Lifetime"
The name Davey and space rock are forever connected thanks to former Hawkwind bassist Alan Davey. But there’s a new Davey on the scene already blazing his own bright trail. Yes, they are related. Louis Davey is Alan’s nephew, but if you think he’s riding along on his famous uncle’s coattails, think again. He’s already making a name for himself as the guitarist of Gunslinger, but also as a solo artist playing his own material. Louis is a man of many talents: on his debut album, Last Chance of a Lifetime, he not only plays lead and rhythm guitars, synths, effects, and drums, but he also writes all the music and lyrics and even co-produces it! Along for the ride is Alan Davey playing bass and synths and other sundry effects (and he’s the other co-producer). But this is really Louis’s show, and quite a show it is. On Last Chance of a Lifetime, Louis forgoes the rambling jams often heard in space rock for some solid and focussed song writing. But he packs a lot into each song, and never wastes a single note. Expect heavy guitar riffing, searing fretwork, deep liquid synths, spacey breaks, catchy choruses, strong melodies and Uncle Alan’s distinctive bass playing. From the exuberant opening cut, Flyin’ High, to the trippy and psychedelic Free, to the anthemic In Her Light, and to the haunting beauty of the instrumental title track, there’s a lot of ground covered here. Louis sings on a few of the songs, but is happy to hand over lead vocal duties to others as well, like Pre Med’s Danny Faulkner, as well as Emma Mackenzie and Lindsey Wyborn. Even his sister, Georgina Davey, gives an emotional and powerful vocal delivery on wistful and longing The Other Face. The different vocalists give the album some nice variety. It’s clear that Hawkwind has been a big influence on Louis, but he finds his own musical voice on the ten tracks that comprise his debut. It looks like we have a bright new light on the space rock scene, and hopefully Davey’s album title is not a prophetic one and we hear much more to come from him in the future.